“Normally” every Thursday (and we’re back to “normal” now the summer courses are over) I go shopping in Guissona. The ancient Roman town of “Iesso”. Thursday is Market Day. Today was my first “normal” Market Day of this Autumn. Hey! It’s Autumn! “Autumn” being also the beginning of the Academic Year. A new rhythm of weekly work, shopping, &c. Not the sort “normal” people have, because our “weekends” don’t coincide with theirs. We’re strange. We work Saturday and Sunday more intensely than other days. We have other anomalies. So I set out to drive to Market, to Guissona. And just two fields before the roundabout, something caught my eye. Something white in the field on my left. Was it a a bunch of seagulls flocking to some revolting manure spread on the field? Was it some egrets in a damp meadow? It was storks. 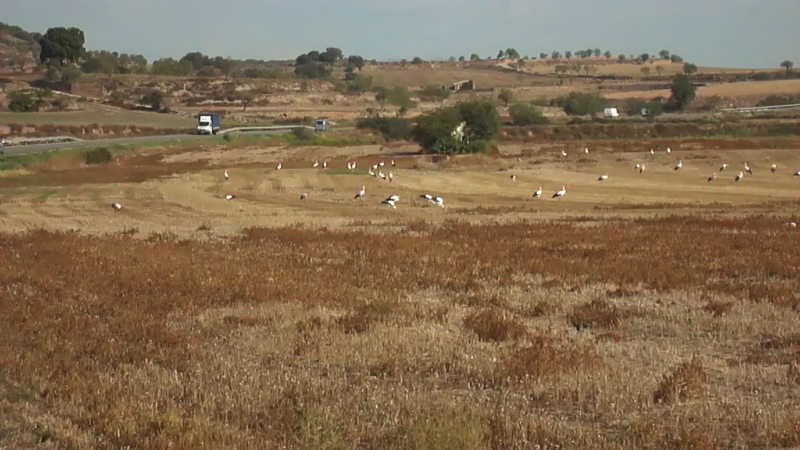 A huge (by my standards) flock of storks. That Thursday (as I get back to my story slowly, it is longer and longer ago) I became very excited, and decided to completely warp my usual sequence of parking and shopping to get to the storks. A dull-looking American housewife [significantly non-native species] in a potentially dangerous locale. Nervously traipsing along the narrow “verge” of gravel between the highway and the array of ditches, camera dangling from my wrist, I progressed. Most vehicles gave me a very wide berth. Whether they thought I was likely to fall over into their paths, or what, I don’t know. That was scary in itself because often I could see that an oncoming truck in the other direction seemed timed to head-on at exactly the moment the vehicle behind me might be at the furthest point of it’s Amanda-avoidance trajectory. As soon as possible, I crossed the ditch. Then I was in a field and less dangerous to traffic. The stubbly field was remarkably uninteresting to tramp through in my American sandals. Strangely, I happened to be wearing black-and-white. I think that might have been an advantage in stork-stalking. With my ungainly gait and sympathetic colouring, I might have seemed less threatening. I wanted to see why they had picked that field. They were eating. They were finding things moist and lively enough in that dry-looking field, that they hopped and pecked and gulped and swallowed. What? Soon I seemed to be “herding” them gently. …and keeping the ambient sound. God, they are so beautiful. I am a storkaholic. Large, bipedal non-human creatures. And they can fly. Wow. I will have more to add to this (and perhaps the story of the other local stork experience (distant ones, filmed by Keith, are a matter of record). But with my slow loading connexion, this is all I can do now. This entry was posted in not letterish nor bathish. Bookmark the permalink. Thanks for this, Amanda! When I began to read the post I was hoping you were carrying your camera with you… And, YES, you were! Great Stork Stalking pics! They are beautiful. What WERE they eating??? I never found out, despite walking around the field later, as well. Perhaps they ate allof it and none was left.